This entry is being posted on behalf of Laura Palmer, candidate for Director in the 2019 STC election. More information about Laura can be found on her STC election page. You can ask questions of the candidates on the STC Election Forum. The election begins 25 February and runs through 11 March. The other day, one of my social media feeds popped up a 2016 article link about Technical Writers. Always curious about media perceptions of the profession, I made the leap—or click, more accurately—to see what the “Money” section of US News had to say. I’m fascinated with articles like this one because I’m looking at ways to reinvigorate the field and, more importantly, to learn how such a great career can resonate with more people. A short read later, the US News facts about job growth and salary made me smile. The 11% predicted job increase between 2016 and 2026, or about 5,700 jobs overall, highlights the excellent career potential for technical writing/communication. As well, the salary ranges still looked solid with a national median of $70K. US News also accurately described the collaborative role of our profession; we are, as the article said, a key member of a team and integral to the success of a product. So really, what’s not to love about the field and all it can offer? For me, the love runs out not with the profession, but with the descriptions of what we do. The US News article referenced writing manuals and documentation, both of which are the bedrock of the profession. Later, video and social media popped up as ways technical communicators may interact with their audiences. But, for me, the overall description of the field still fell flat; it lacked a true reflection of the richness and breadth of what technical writers/communicators do every day. As the Chair of an academic department housing a technical communication degree, recruiting high school students and others into our program forms a big part of my everyday life. Of course, a career in technical communication doesn’t have to start at the college level; but, for the late-teens and early-20s demographic I see, college is a good beginning. From speaking with students, I’ve learned that describing the field as writing instruction manuals and working in manufacturing doesn’t bring eager freshmen to our programs. Students transferring to our school with an associate’s degree—generally a non-traditional and more pragmatic cohort—still aren’t thrilled with the “manuals and manufacturing” manifesto. It doesn’t sound like a compelling career option. As a profession, we’re an amazing cross-section of people, jobs, competencies, and qualifications, but how do we convey all this potential of technical communication to others? I know that at our college recruiting fairs, students tend to take what they’ve liked from the last few years and seek out the same in college. Thus, my administrative colleagues in Psychology, Journalism, and Public Relations feel the rush of the crowd at their table, while my table definitely has a more reserved vibe. So, back to that recruitment fair for a minute. Remember I said high school students tend to make college choices based on what they already know and love from their high school classes? A quick online search of “technical writing, high school” reveals only a handful of high schools that include a technical writing course in their curriculum. 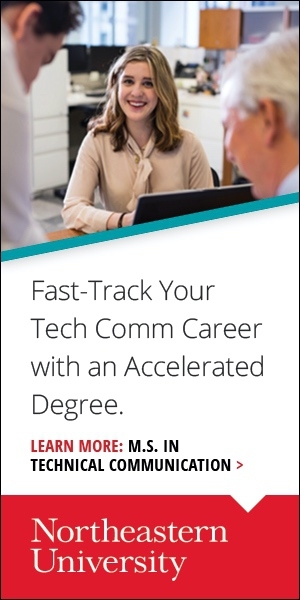 If students don’t know technical communication/writing exists, how can we expect them to consider it as a major or even a minor in college, let alone a career? A big part of my recruiting efforts for 2019 and beyond will be directed at introducing high school students to technical communication. I’m reaching out to high school counselors and advisors to help them get the word out about a profession that’s growing and has the potential to pay well. I’m currently attending events at the local schools to talk about the field and what it means to be a technical communicator. From these efforts, I hope to bring new ideas to the Society for Technical Communication for reaching out to the next generation of members.